Mike Tyson has the famous quote, “everyone has a plan ’till they get punched in the mouth.” The Chicago Sky were able to withstand body blows with their MVP out of the game however they eventually were punched in the mouth. The Sparks led 52-35 at halftime, pulling away with a 23-8 run to end the second quarter. Parker had nine points, Ogwumike seven and Kristi Toliver hit a 3-pointer to cap their scoring. They shot 62 percent in the half. Three-time NBA MVP Magic Johnson hugged Ogwumike before she received her WNBA MVP trophy from league president Lisa Borders before the game. On hand to support Ogwumike was her sister Chiney, who plays for the Connecticut Sun, their mother and an uncle. The rich get richer; Sparks center Jantel Lavender won the league’s sixth woman award also, receiving 26 of the 39 votes from a national media panel. Lavender came off the bench in all 34 regular-season games after being a starter the previous two seasons. She averaged 9.6 points and shot a career-high 53.8 percent from the field. 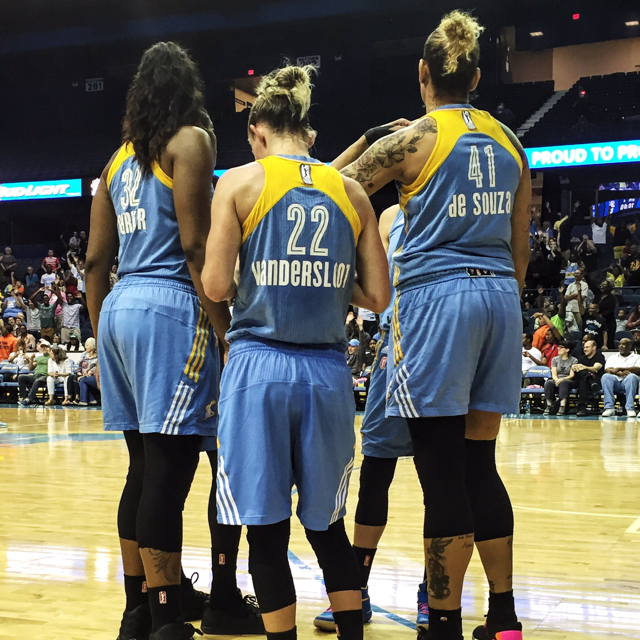 The Sky was missing injured MVP Elena Delle Donne and her team-leading averages of 21.5 points and 7.0 rebounds. Delle Donne sat on the Sky bench in street clothes with a wrap on her right thumb after recent surgery. In her absence, the offensive load was spread among four players. Jamierra Faulkner scored a team-high 13 points off the bench. Cappie Pondexter added 12, Tamera Young had 11 and Courtney Vandersloot 10. Game 2 is Friday at Staples Center, the Sparks’ home court that was unavailable for the best-of-five series’ opener because the Los Angeles Kings were playing an exhibition.